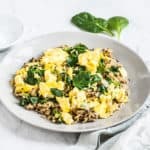 Ladies and gentleman, I’d like to introduce you to the world’s quickest healthy brown rice breakfast bowl with eggs and spinach. We’re talking 10 minutes and under. “But how? !” you might be asking yourself. Let me tell you the secret. I am grateful I live in a time where microwave instant rice exists. ESPECIALLY brown rice. Ain’t nobody got time to wait around for the better half (or should I say butter half?) of an hour while their brown rice cooks. Thanks to Costco and Amazon, you can now have perfectly flavored brown rice and quinoa ready in 90 seconds. I buy this brand. While my rice is nuking in the microwave, I simply throw on some scrambled eggs and spinach. Do you know the secret to perfectly fluffy eggs? Okay, I’ll tell you that, too! You must mix them together in a bowl until they are pale yellow BEFORE you pour them into the frying pan. Don’t mix them directly in the frying pan. Then you need to always cook on medium low heat and let them fully cook on one side before scrambling them. This ensures that they are in big, fluffy chunks, as opposed to sad, crumbly bits. I know you know what I’m talking about. Years ago I was the world champion of tiny scrambled egg crumbles that were hardly edible. And now I have a food blog. Living proof (not the hair care brand) that you can be anything you set your mind to! Best part about this breakfast is it’s one babies and little kids can and WILL eat. I make a big batch for our family in the mornings, and they gobble it up. Okay, so maybe two thirds of the kids don’t eat the spinach, but at least they are getting a good source of protein so they aren’t monsters. 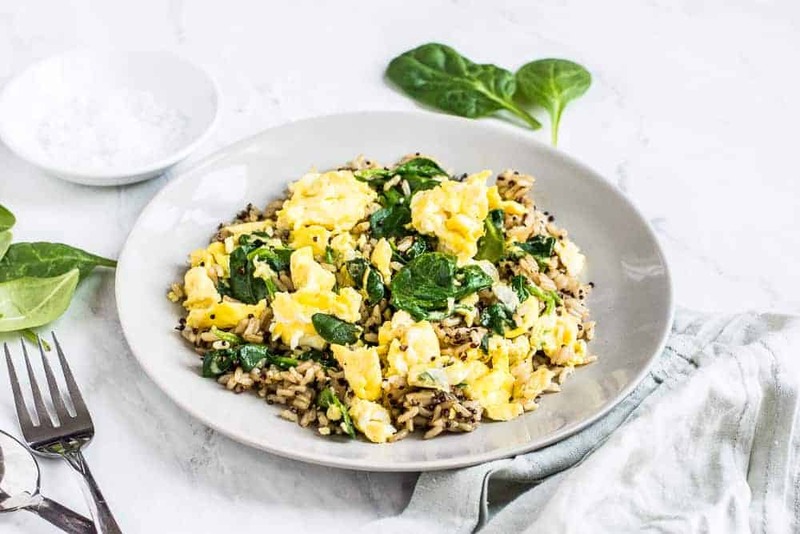 Grab the recipe to this healthy brown rice breakfast bowl below and enjoy! 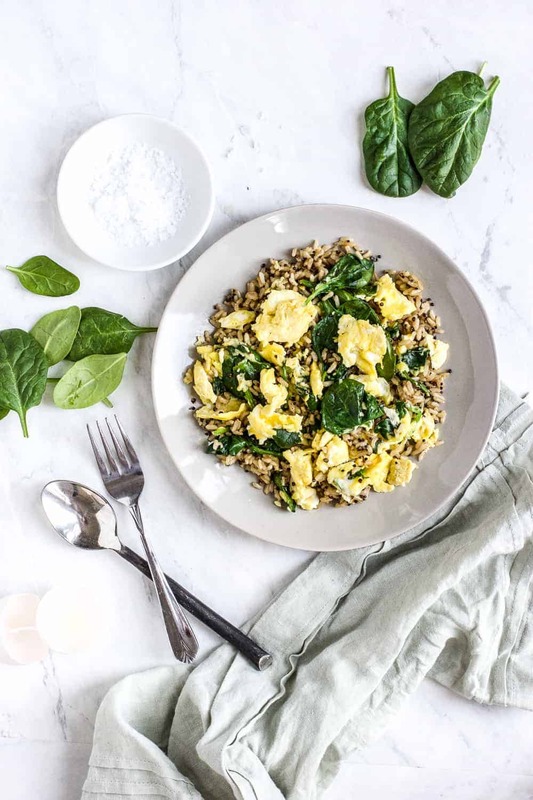 This is the best quick and healthy brown rice breakfast bowl with eggs and spinach. It's an easy family breakfast recipe everyone will love. Microwave rice packet per instructions on bag. Pour avocado oil in frying pan and warm pan on medium-low heat. 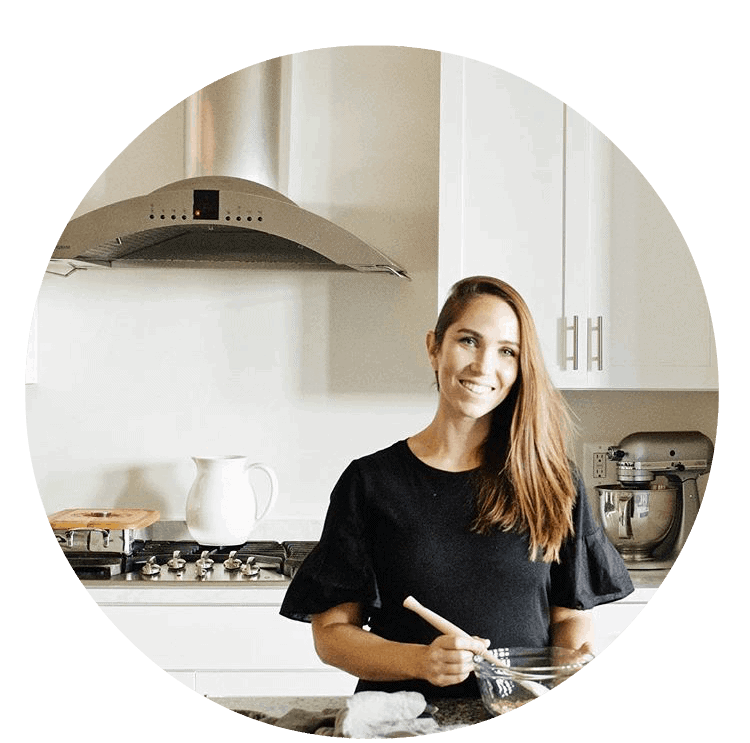 While rice is cooking and pan is warming, whisk together eggs in a mixing bowl until fluffy and pale yellow. Pour eggs into the frying pan and cook on medium-low heat until bottom side is cooked. Use a spatula to flip to the other side, gently scrambling together to make big chunks. Fold in spinach and cook about another 2 minutes. Add salt and pepper to taste. 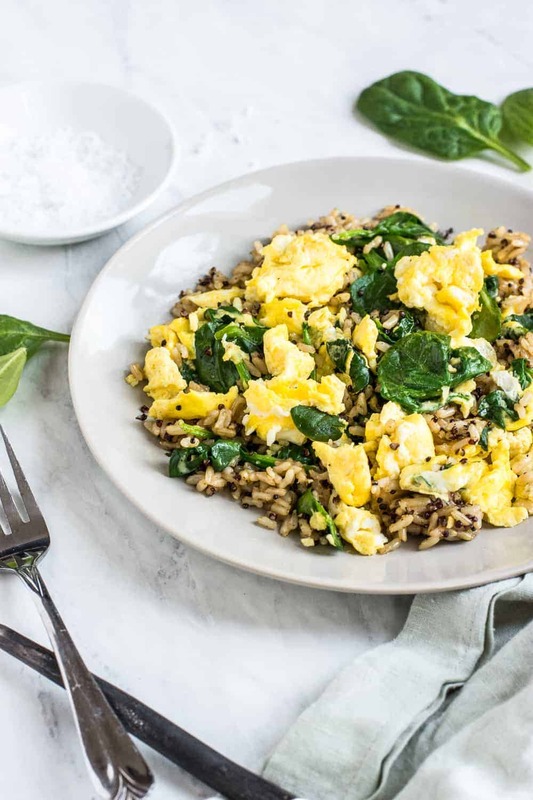 Assemble rice bowl by pouring rice, eggs, and spinach together. Add any additional spices as wanted. Enjoy!